Somehow I found myself wandering through the middle of the grocery store, well, more to the point, the cereal aisle. I must have looked for nuts or something to end up in the isle but while visiting, a lot of my childhood memories rose up and slapped me in the face. I can not count on my fingers and toes the numbers of boxes of Captain Crunch that tore the living daylights out of the roof of my mouth. Seriously. I don’t know if that’s a rite of passage as a kid or what, but it never stopped me from devouring box after box of it. My absolute favorite cereal as a kid was Cocoa Puffs and my visit down sugary memory lane had me nostalgic for a taste. I decided to try my hand at making a Paleo cereal version. Ok, first off, right out of the oven this stuff is crazy good. Do not eat a huge bowl of it because you will absolutely burst at the seams. It is filling. I’m warning you ok.
Second, this will soften up over time. I didn’t store it in an airtight container and that may be why but by day three is was softer -still yummy- but softer. It was almost the consistency of a graham cracker. Third, when I make this in the future I will simply make it a flat cereal like Paleo Chex. Why? One – rolling it into small 1/4″ balls takes a lot of time and I am too LAZY to do that. Also, when rolled flat it was super crispy. This recipe would also work well as a chocolate graham cracker – just saying. First grind the almonds in a food processor or blender until you have a flour. Add the ground almonds, ghee, sea salt, coconut flour, egg white, honey and cacao power to a bowl and mix with a spoon until you have a dough. a) Place the dough onto a piece of parchment paper. Place a second piece of parchment paper over the top and roll it until it is ¼” thick. With a wet knife, score it into 1” squares. Place the parchment paper on a baking sheet when finished. b) Take a small pinch of the dough and roll into a ¼ round ball and set on a baking sheet lined with parchment paper. Turn on your oven and set to 350 degrees and bake for 15 - 18 minutes for cereal balls or bake for 8 to 12 minutes for flat cereal. Top with your favorite milk and enjoy! You can store this in an airtight jar for 3 to 4 days (if it lasts that long). A Cocoa Puffs knock-off. LET ME AT IT! It should be fine 🙂 I would do one cup of almond flour. And gluten free to boot? You’re the BEST Kelly! YOU are a genius. Cereal is one of my favourite things in the world and if this works, you’ll be one of my favourite people in the world. This recipe looks super yummy! Could I just use already ground almonds? How much of those do you think I should use? I laughed out loud at the roof of the mouth comment. Too true! I just might have to try this for those times I am craving cereal! Tee hee! The things you remember as a kid. Yes Please!!! 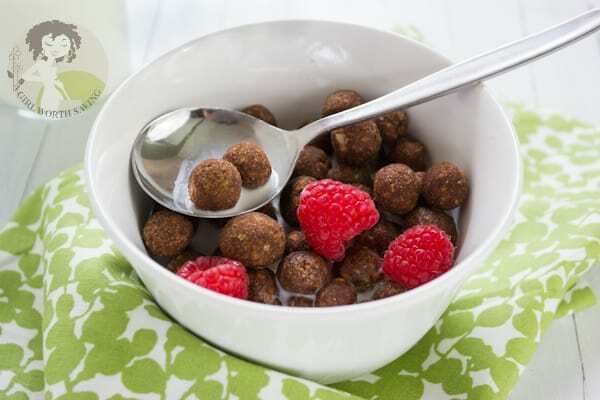 I love chocolate cereal. Excellent recipe. I am not on a paleo diet, but I want some! Girl, you are a freaking genius. 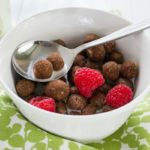 And not only does this work as a paleo cereal, but it’s just a healthier version of Cocoa Puffs in general. I totally want to try this! I love me some chocolate cereal and this looks amazing. Okay, I would never think of making my own cereal! How AWEsome is this! 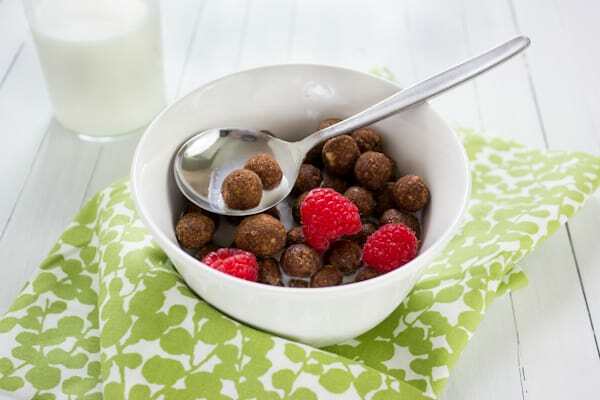 Okay, I am not Paleo and I hate Cocoa Puffs but this cereal looks amazing! I may have to try it! You could try sunflower seeds. The honey in the recipe might help with that tang from the nuts. Let me know if you try it! I had seen this recipe earlier and so far this is the best recipe for grain free cereal I have seen so far. This is like the best discovery of the week for me. Thank you for this recipe. I am definitely going to try this recipe during the weekend. And I bet this would be delicious with a dash of cinnamon on top just saying. This looks really good, I’ll have to try it out. I’m am really tired of eggs in the morning, that is for sure. This would be a great alternative when my kids are wanting Cocoa Puffs!! How fun! Proves you can be healthy without doing without. Cocoa puffs were my fave too! This actually looks really delicious! :Looks delish actually! Sounds wonderful too! I never knew you could make your own cereal like this! Cool! I made this last night! It tastes really great, but mine were kind of soft on the inside. Is there anything I can do about that? Has anyone else experienced this? Hi Samantha, If you make it thicker than 1/2″ it will be more doughy than crispy. Keep the crust about 1/4 thick and you will have a crispy crust. I’ll update the recipe. Hi Denise. My only concern would be the egg? Would low heat cook it enough? I’m pretty sure if you dehydrated it for some time it would stick together well. Hi! I’m going to try this recipe this weekend (started a paleo challenge abt 4 weeks ago and seriously miss cereal….which is odd b/c I never really eat it anyway). Did you use unsweetened cocoa? I have some in the pantry and have been using the unsweetened variety for paleo recipes. Yep, unsweetened cocoa is exactly what I use. I hope you like it! I was wonderinf if it would be alright to leave out the coconut flour, maybe a little extra almond flour? Thanks! My husband is going to be SOOOOO HAPPY that I found this! This looks awesome! Found you through a friend’s share on FB. Hope you’re having a nice week. I’ve posted the new Homemaking Party for the week and would love to have you link up, if you’d like! I am planning to create a food blog and post your recipe. I would love to site you and show my followers how amazing you are! Is that possible? Hun, I would be happy to talk to you about sharing my recipes if you email me. I do ask that you only share my photo and link to the name of the recipe and not post my recipe on your site. I was wondering how long it stays fresh in a “cereal” box? Mary, I would recommend storing this in an airtight container in your fridge for no longer than 7 days. Would any other sweetener work? Don’t do honey, agave, or maple syrup. How do you think liquid or powdered stevia would affect consistency of the final product? Thanks! I have never baked with stevia so I can’t tell you exactly how to go about this. I would add the sweeter of choice – taste. Then add the egg and then add water til you get a cookie dough consistency. can i do the same recipe with only Coconut flour no almonds ? Ohad, I would suggest trying another nut or seed if you want to make the recipe because only coconut flour will change the recipe completely. Do u think chia seeds or flax would work for this recipe as we can’t have eggs. If so how much? Linda, I’m not sure. You might try the energy egg replacer? Great idea! We’ll definitely try this as occasionally it’d be nice to have cereal for brekkie instead of eggs, meat, veg etc. I hope you enjoy it! It’s very filling! In the oven right now! So excited!! Made this for the first time today. I made flat pieces and balls. We like the flat pieces better. We will not eat this as a cereal, but it is a good snack. Also, you definitely need the parchment paper the ones on the outside burned. I’m glad you enjoyed it hun. I like it flat better too. So I made this these morning, and I think it needs some tweaks. I did half balls and half “chex” squares. I used 1cup of almond flour rather than whole almonds. The squares burnt at about 13mins. So less time on those next time. The cereal itself was soooo bitter. I’m going to use less coco powder time and add a little vanilla extract. Thanks for the starting point! I’ve never heard that they were bitter. I hope the changes you make help! If you make them in squares rather than balls, how long will the cook time be? Hi Kristan, you’re looking at probably 10 -12 minutes. We made these this past weekend and they were a hit. They were not super sweet but we like that, I’ve been weening my kids off the sugary cereals so this was perfect. It’s a lot of work but a treat. Thank you so much. Thanks for sharing Colleen and I updated the recipe so people will be aware. I am baking it after fighting so hard not to eat the mixture. it taste really really good. Yeah! I’m so glad that it worked for you Allie! Just made these as chex/flakes instead of balls as recommended. Definitely NOT a recipe to skimp on the sweetener, I just did a drizzle of honey and the cocoa makes for an intense almost bitter dark chocolate taste. Not complaining! Am enjoying a bowl w some coconut flakes and a bit more honey over the top. Great Recipe! I let my son help me make these and he actually wanted to try them! Thank you so much!!! May I please re-post this to my blog? So glad you enjoyed it Amanada! You are free to link back to the recipe but please do not repost it on your site. for this recipe, the coconut oil: did you melt it first before adding??? Hi, I was wondering what you thought of double batching the recipe and freezing half. Since they don’t last long, it’d be a pain to keep making but if you just dough frozen and defrost and bake, Maybe you could even freeze in rolled out form even? I don’t see why you counld not do this hun. My ‘dough’ was extremely dry, I had to add almond milk. Was I the only one? Plus super easy to burn them but i like the not-burned half. great idea btw. Sorr you had issues hun. These are seriously amazing! But yes, total gut bomb. And yes, squares over balls. Looking to tweak it a tad so that it’s not so heavy but I’ll be making the original recipe (again and again) for the kiddo. Thanks so much! Glad you enjoyed them hun! Going to make these… but in a piping bag and squeeze little ball shapes out ???? I did some digging and found that 1 cup whole almonds equals 1 1/2 cup ground almond flour. Will try the recipe using this data as I don’t have whole almonds. I love the fine texture of Hoosier Hill almond flour! Sorry…meant to say Honeyville Blanched Almond Flour. WOW! I made these because I am paleo for a month right now and they are so Delicious!! They taste like little brownies! Next time I am making a double batch cause they go so fast ! So glad you enjoyed them Morgan!